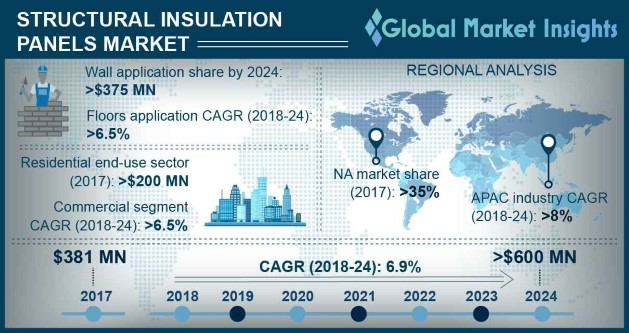 Structural Insulation Panels Market size will surpass USD 590 million by 2024; according to a new research report by Global Market Insights, Inc. Significant growth in the construction sector supported by rapid urbanization and industrialization will be a key impetus for structural insulated panels market growth. Technological advancements in residential & commercial construction regarding the energy conservation and reduced operational expenses will augment industry demand during the forecast period. Huge potential for new construction in South Africa, China, and Mexico along with favorable government regulations & policies towards green buildings will enhance product penetration. Increasing R&D investments with respect to the high-performance, energy-efficient building components to conserve significant loss of natural resources will stimulate SIP penetration. These advancements are providing modern and fast-track building techniques for new residential and commercial construction which in return will boost the overall industry landscape. Moreover, collective efforts from the U.S. Government and Department of Energy are strongly promoting the best practices for the energy-efficiency concept further fostering positive business outlook. Several government policies & regulations for increasing energy efficiency of residential & commercial buildings resulting in the prevention of natural resource depletion will promulgate the industry growth. For instance, EU Directive 2012/27/EU for Energy Efficiency (EED) have a key focus on improvising energy consumption by controlling energy usage in the buildings and renovate 3% publicly owned buildings acquired by central govt. With an area greater than 250 sq. meters annually. However, numerous innovative building practices, such as modular construction practices may negatively impact the business expansion over the forecast time frame. EPS is anticipated to witness over 7% growth from 2018 to 2024. Expanded polystyrene is made from rigid cellular plastics and small beads of polystyrene raw materials. Major factors include easy to install, lightweight, energy-efficient, and availability in different colors will augment the structural insulated panels market. In addition, highly compatible with the OSB, minimum water absorption, and low vapor permanence are among the major benefits offered by the EPS. OSB one side skin type will surpass USD 75 million revenue in the forecast period. Improvised code-compliant air barrier function of OSB one side owing to improved permeability will be a key impetus for industry growth. Potential usage in the construction of roofing and sliding walls to attain improved moisture resistance and heat transfer will proliferate the segment size. Walls application held for more than 55% of the overall structural insulation panels revenue share in 2017. Continuous insulation provided by the application promoting uniform wall temperature and reduced moisture collection & convection which benefits building air quality and occupant comfort will proliferate the business expansion. Moreover, SIPs undergo negligible warping as compared to conventional material resulting in the installation of walls with more accuracy, will further propel the industry landscape. Residential building applications are projected to surpass 45 million square feet demand by 2024. Customers are majorly focusing on building revamps with significant energy efficiency. Increasing adoption of new emerging solutions offering superior performance and enduring the building regulations will propel the end-use penetration in the structural insulated panels market. APAC SIP market will witness over 7% CAGR from 2018 to 2024. Rising support from several government authorities across the region coupled with rapid infrastructural developments will promote positive business outlook. The upsurge in the construction expenses along with high industrialization rates in developing economies, including China, India, and Malaysia will augment the structural insulation panel's application scope across the region. Kingspan Group, Eagle Panel Systems, Inc., Foam Laminates, ACME PANEL, Future Building of America, Foard Panel Inc., Insulspan Inc., Isopan, and Nohara Holdings, Inc. are among the major structural insulation panel companies. The global industry share is consolidated due to the presence of a large number of industry players. Production facilities enhancement, product innovation, mergers & acquisitions, and portfolio expansion are among the key strategies to gain significant share by the major market players.